Best Spooler Fixer Software, fix PC errors in 3 Steps! Smart Spooler Fixer Pro is professional Print Spooler fixer. It can not only fix Print Spooler problems and errors but also quickly identify invalid entries that cause the computer to slow, freeze or crash. The product provides a set of tools to repair Windows registry problems, safely and securely speed up computer performance and optimize system settings. So you will enjoy many automatic fixes and can manually fix all system problems! Smart Spooler Fixer Pro is specialized in fixing printer spooler error. If you want to completely get rid of spooler error, Smart Spooler Fixer Pro will be your best choice! Smart Spooler Fixer Pro offers people easy-to-use process which means you can fix your spooler error all by yourself. If you see print spooler error every time you try to print something and restarting print spooler service won't help. Your really need a professional software to help you. Smart Spooler Fixer Pro is totally different from other software. This program possesses distinguished features. Smart Spooler Fixer Pro is consist of Five Part. ScanandClean offers you the fast scan of your whole computer which will completely remove your computer\'s cookies, registry errors. System Optimize helps you make good use of your computer. System Fix contains many common errors resolving method which you can fix it with just several clicks. System Tools can be used to update your windows automatically. Back up function can largely protect your important files. With all the above function, Smart Spooler Fixer Pro is widely used all over the world and has been proved the most effective spooler error fixer. Just give it a shot! 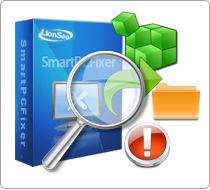 * Smart Spooler Fixer Pro will fix PC errors in 3 Steps!